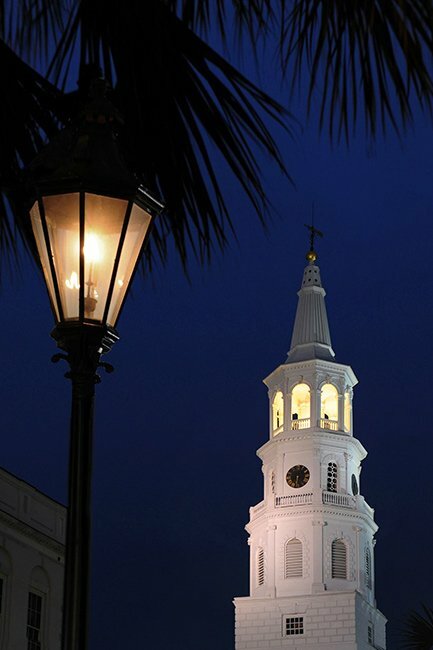 The white spire of St. Michael’s Church is one of the most iconic images of Charleston. 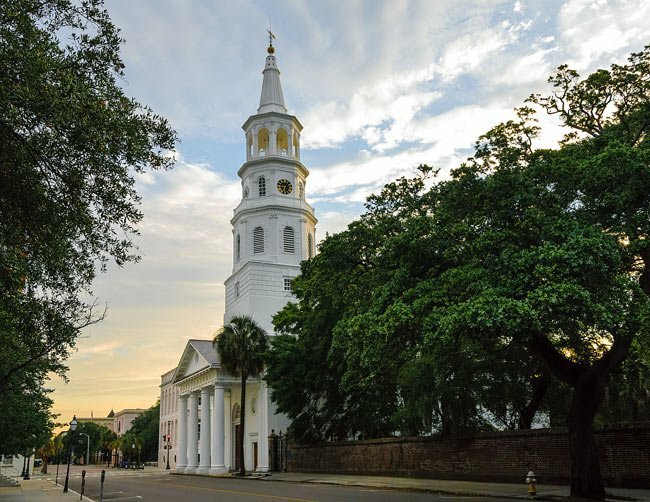 Built in the mid eighteenth century, this historic church is the oldest church structure in the city and continues hosting services every Sunday and throughout the week. It is located at the Four Corners of Law, on the southeast corner of Broad and Meeting streets. In the 1680s, the Holy City’s first church, St. Philip’s, was erected on the same corner where St. Michael’s now stands. At that time, St. Philip’s was a small, simple wooden structure. By 1727, St. Philip’s congregation had outgrown its space and a larger church was built a few blocks away (on the aptly-named Church Street). 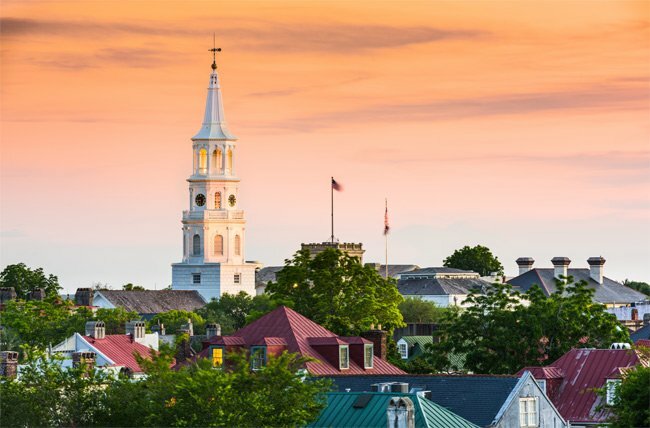 The population of Charleston continued to grow and in less than 25 years, the city was too large for just one Anglican church. In 1751, St. Michael’s was built on the property of the original St. Philip’s, and the first services were conducted there in 1761. Except for the addition of the sacristy in 1883, the structure of the building has remained largely unchanged. The architect of St. Michael’s is unknown. The design, however, is described in the Book of Common Prayer and is intended to allow all worshipers to hear and participate. The alter is located in a shallow recess close to the congregation, and pews on three sides allow more people to be near the center of worship. 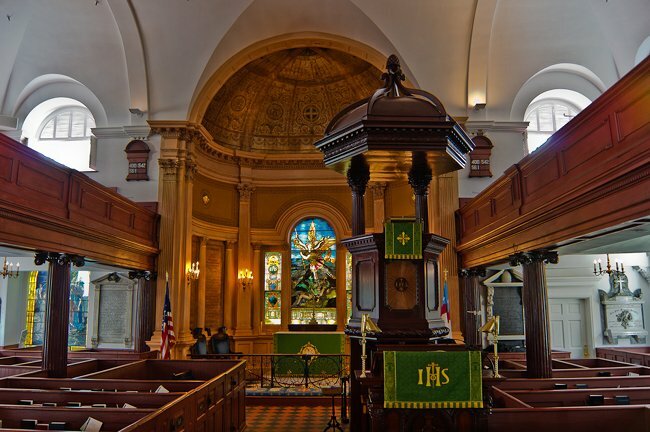 Remarkable features of the church include the steeple, which is 186 feet high, a long center pew where both George Washington and Robert E. Lee sat to worship, and a Tiffany stained glass window in the chancel. The clock and eight bells were imported from England in 1764. Each of the bells has been recast at least once, and the clock was restored in 1993. As noted above, St. Michael’s stands at the intersection of Meeting Street and Broad Street, known as the Four Corners of Law. The US Post Office (seen on the right in the photo below) on the southwest corner represents federal law. The Charleston County Courthouse represents county law on the northwest corner. Municipal law is represented by City Hall on the northeast corner, and St. Michael’s, on the southeast corner, represents God’s law. St. Michael’s Church graphically illustrates the great increase in wealth and power in the Southern American colonies by the middle of the eighteenth century. Although possibly designed by an unknown architect and built by Samuel Cardy between 1752 and 1761, St. Michael’s shows a keen awareness of its architectural prototype by the English architect, James Gibbs’ Saint Martin-in-the-Fields (1726). 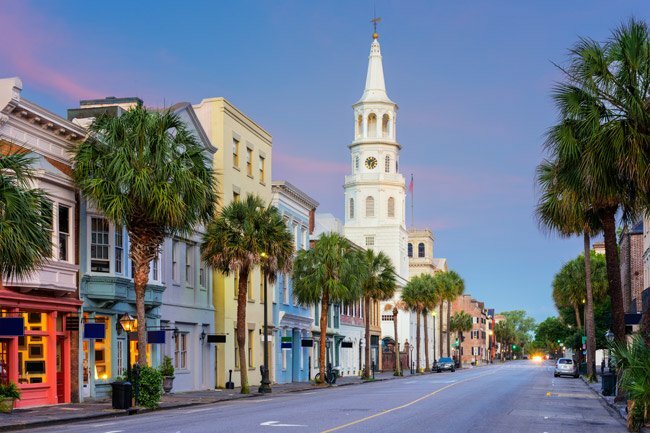 The two-story structure of Saint Michael’s is of brick, stuccoed over, and radiating its brilliant white paint skin in the sub-tropical Carolina sun. The classical portico dominates tremendously the Broad Street front, and together with the steeple, dominates the whole exterior. 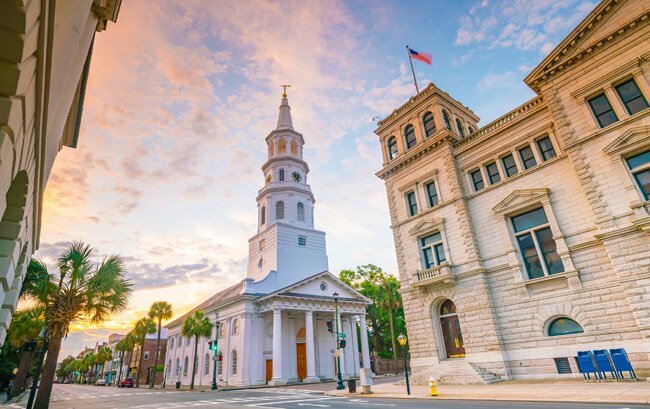 It is a giant two-story portico with Tuscan columns, the first American colonial church to have the giant portico. The columns are of stuccoed pie shaped brick, the roof of slate, with a slight outward bend near the eaves, and the roof of the steeple of cypress sheathed in copper. 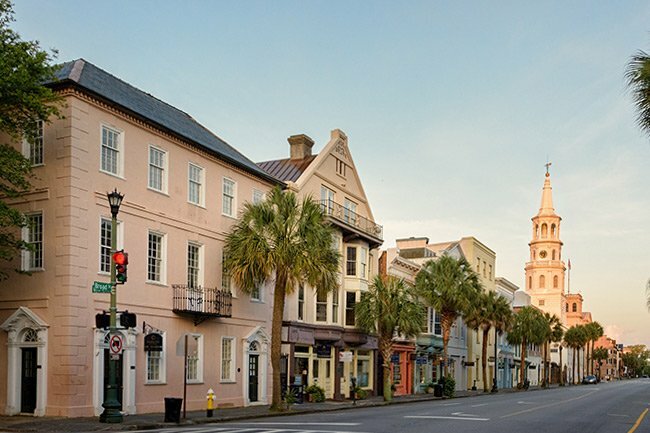 The balustrade at the arcade level of the steeple was carved by one of Charleston’s foremost colonial woodworkers, Thomas Elfe. The two-story seating arrangement of the interior is articulated at the exterior, by the rows of round arched windows. Each window is surrounded by the Renaissance rustication that came to be known in England as the Gibbs surround, in France as Serlions. Pairs of windows are visually separated from others by a two-story pilaster, supporting the undecorated entablature. 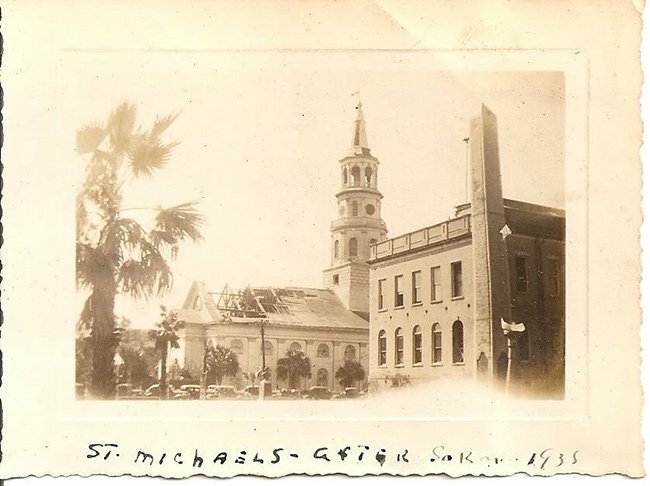 In addition to suffering damage during Charleston’s 1886 earthquake, Charleston was also a victim of the 1938 tornado. The historical photo below was contributed by Ruth Rawls and shows the building shortly after the storm. The photo is owned by Leslie Lawton Bateson and were taken by his father, Richard Humphreys Bateson. 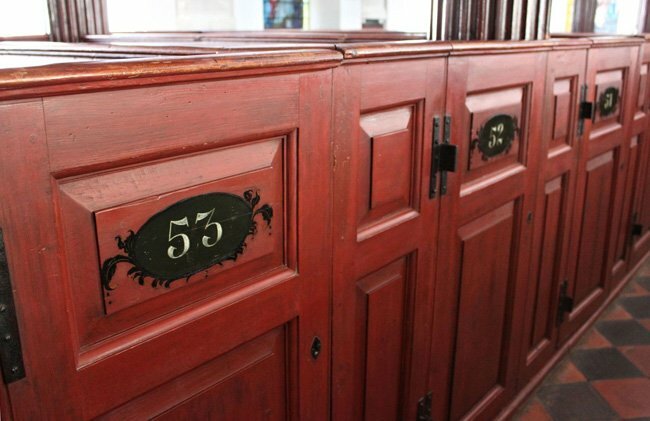 This long, central pew, number 43, also served General Robert E. Lee when he worshiped at St. Micahel’s. 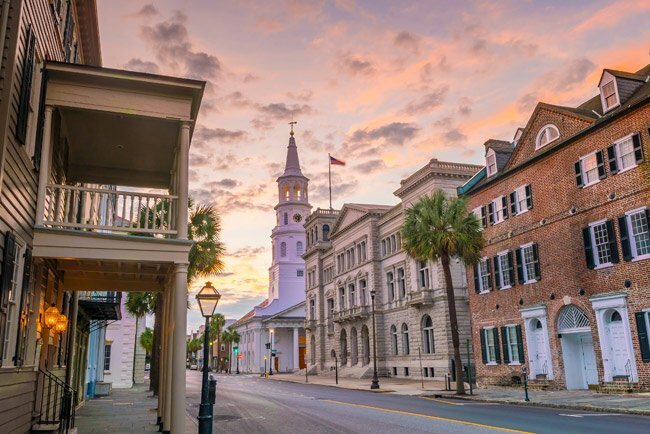 In an interesting conversation on our SC Picture Project Facebook group, Brandon and Michelle Godkin List discuss seating in South Carolina’s early church history – an accommodation we now take quite for granted. Photographer Brandon Coffey, who submitted the photo above says, “Sometimes in passing the most simple of thing can fill your mind with one hundred scattered and broken thoughts. Upon exiting St. Michael’s Church in Downtown Charleston, I noticed this ancient doorway held open with the modern world waiting just beyond its threshold. Seeing this made me think of how many people have walked through this very door. 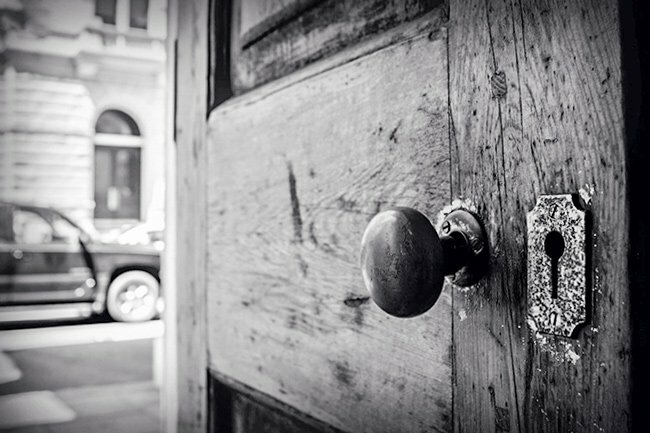 How many people have touched its original doorknob coming to unload their thoughts, hopes, dreams and burdens. A newly born baby being baptized or the mournful service of a loved one passed. Even our great nation’s first president has walked through this very door and worshiped in the same environment I am standing. 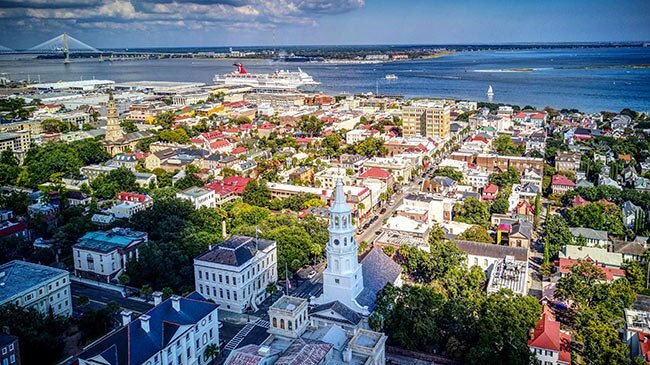 Some of the most influential people in shaping Charleston’s history have worshipped and their families still do worship here. I had the privilege of working one block from the Four Corners and saw this church every day. I have also attended weddings at this church. 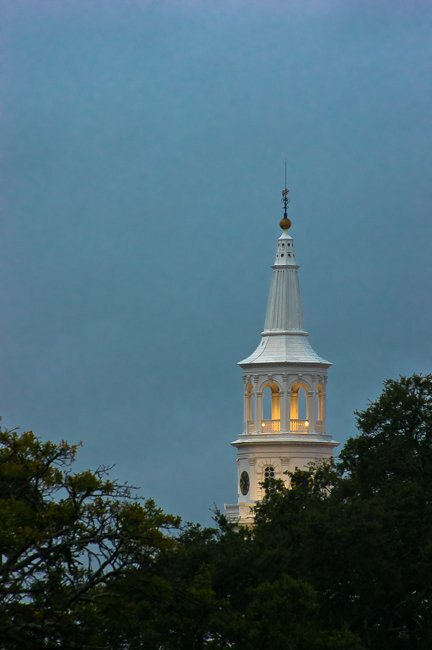 I do not know if it is folklore or fact but I was told that during the Civil War the steeple had to be painted black. Otherwise, it was a beacon for the incoming Northern troops. Please check this yourself with someone who is probably more knowledgeable than I. Thank you for your concern! 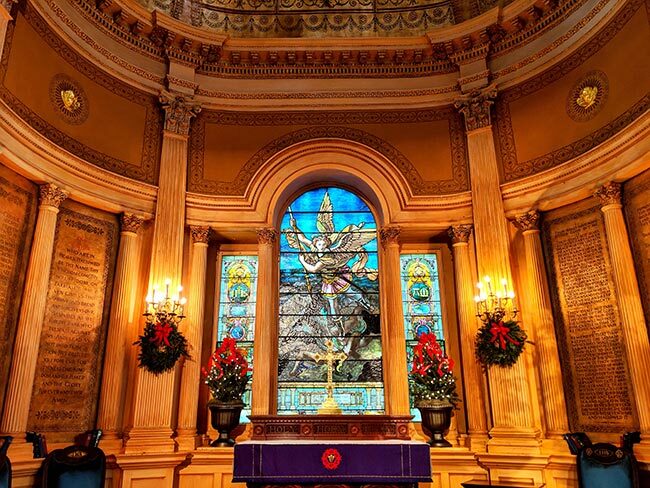 St. Michael’s survived the storm intact and even held worship service on Sunday, October 9! My husband and I attended Easter service at your beautiful church 10 years ago. I have been concerned about how it fared after Hurricane Matthew. This is so great — I love to visit because my grandpa is buried there.